So here we are the day after Christmas, and my title today includes the word “piece.” I really, really dislike that word! And it is Christmas that caused this disaffection, especially for the pluralized version: “pieces.” All of this has to do with having had a large family of children with the celebration and giving of gifts at Christmastime. When God handed out the logical reasoning ability that enables a person to instinctively know how to put multi-piece things together, I was apparently standing elsewhere in some sort of academic geek-squad type of line. And as proof that I never learned a lesson from this, yesterday Diana and I did it again! Yesterday we gave as a gift to our eight grandchildren a gigantic outdoor trampoline that will be set up at our house and be always here to get them out of the adults’ hair by sending them outside to enjoy jumping and playing upon like their fathers did when growing up at the same house. 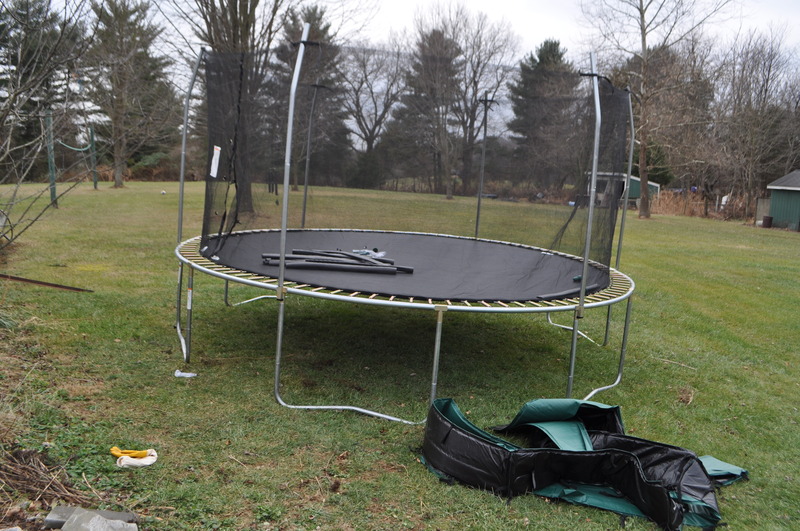 However, the trampoline was shipped to us in two very large boxes, and there is “some assembly required.” Ugh! Pieces! The Christmas story (which is the beginning of the pinnacle scene of God’s Big Story) involves a lot of pieces over time. The actual end of the story is yet to be seen and fully realized, and it is confusing to know what is yet to come in the culmination of time and the return of Christ. We have Scriptural puzzle pieces for this, but Christians don’t always agree as to exactly how they fit together. But if you think our situation is confusing, imagine what it must have been like for an Old Testament prophet. At least for us we have the story of the incarnation, the life of Christ, the cross and the resurrection as historical events. All of these things were puzzle pieces to God’s people before the coming of Jesus. How could they – even a spokesman for God like a prophet – put all of these pieces together? The answer is that they really couldn’t … not nearly completely at all. So let’s pick one of these prophets – the last one, Malachi – and use him in a first-person way as an illustration of that frustrating conundrum for those who so, so, so wished to understand what it all meant. (Reading from Exodus 12:21-28) – Then Moses summoned all the elders of Israel and said to them, “Go at once and select the animals for your families and slaughter the Passover lamb. 22 Take a bunch of hyssop, dip it into the blood in the basin and put some of the blood on the top and on both sides of the doorframe” … “Obey these instructions as a lasting ordinance for you and your descendants. 25 When you enter the land that the LORD will give you as he promised, observe this ceremony. 26 And when your children ask you, `What does this ceremony mean to you?’ 27 then tell them, `It is the Passover sacrifice to the LORD, who passed over the houses of the Israelites in Egypt and spared our homes when he struck down the Egyptians. '” Then the people bowed down and worshiped. 28 The Israelites did just what the LORD commanded Moses and Aaron. MAL 3:1 “See, I will send my messenger, who will prepare the way before me. Then suddenly the Lord you are seeking will come to his temple; the messenger of the covenant, whom you desire, will come,” says the LORD Almighty. MAL 3:2 But who can endure the day of his coming? Who can stand when he appears? For he will be like a refiner’s fire or a launderer’s soap. 3 He will sit as a refiner and purifier of silver; he will purify the Levites and refine them like gold and silver. Then the LORD will have men who will bring offerings in righteousness, 4 and the offerings of Judah and Jerusalem will be acceptable to the LORD, as in days gone by, as in former years. GE 49:10 The scepter will not depart from Judah, nor the ruler’s staff from between his feet, until he comes to whom it belongs and the obedience of the nations is his. JOB 19:25 I know that my Redeemer lives, and that in the end he will stand upon the earth. JOB 19:26 And after my skin has been destroyed, yet in my flesh I will see God; JOB 19:27 I myself will see him with my own eyes–I, and not another. How my heart yearns within me! Isaiah 9:6-7 – For to us a child is born, to us a son is given, and the government will be on his shoulders. And he will be called Wonderful Counselor, Mighty God, Everlasting Father, Prince of Peace. Of the increase of his government and peace there will be no end. He will reign on David’s throne and over his kingdom, establishing and upholding it with justice and righteousness from that time on and forever. Micah 5:2 – “But you, Bethlehem Ephrathah, though you are small among the clans of Judah, out of you will come for me one who will be ruler over Israel, whose origins are from of old, from ancient times. Isaiah 53:5-6 – But he was pierced for our transgressions, he was crushed for our iniquities; the punishment that brought us peace was upon him, and by his wounds we are healed. We all, like sheep, have gone astray, each of us has turned to his own way; and the LORD has laid on him the iniquity of us all. (A voice reads from 1 Peter 1:10-12) Concerning this salvation, the prophets, who spoke of the grace that was to come to you, searched intently and with the greatest care, 11 trying to find out the time and circumstances to which the Spirit of Christ in them was pointing when he predicted the sufferings of Christ and the glories that would follow. 12 It was revealed to them that they were not serving themselves but you, when they spoke of the things that have now been told you by those who have preached the gospel to you by the Holy Spirit sent from heaven. Even angels long to look into these things. (A voice reads …) 2PE 1:19 And we have the word of the prophets made more certain, and you will do well to pay attention to it, as to a light shining in a dark place, until the day dawns and the morning star rises in your hearts. 20 Above all, you must understand that no prophecy of Scripture came about by the prophet’s own interpretation. 21 For prophecy never had its origin in the will of man, but men spoke from God as they were carried along by the Holy Spirit. Yes, here in 2016 we still have some assembly required. But we have enough of the pieces of the puzzle to know and see God’s Big Story with a great deal of clarity. And in this, we are very blessed, even as we look for the next coming of our Lord. This entry was posted in First-Person Christmas and tagged Malachi by Randy Buchman. Bookmark the permalink. I can attest to heavy those two trampoline boxes can be! I haven’t had to assemble those units but I’ve helped ship a large number of them. It is a good thing that you have some good strong help to carry those boxes out back and help set them up. If not, you’d have to drag that box across the yard, probably damaging the grass. Such is our lives… like grass that withers … yet our inheritance is eternal. My boys were so excited about the present being given to their next generation that they all went outside and put it together quickly on Christmas Eve (when we did the presents). By the time they got it together however, most of the kids were pretty well shot and living in extra innings, but I’m sure they’ll eventually enjoy it — though their fathers may still enjoy it more.